29 gifts… | maya c.
So, it’s more than half way through the month and I just realized I completely forgot about one of the challenges!! I forgot about the most important one!! GIVING! 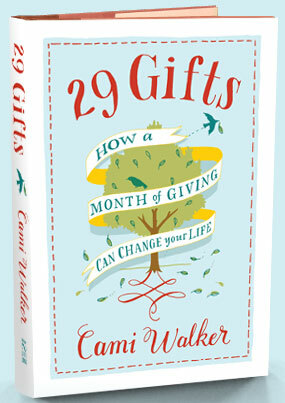 A few months ago, I read Cami Walker’s 29 Gifts: How a Month of Giving Can Change Your Life. The book is an autobiographical account of Walker’s fight with MS and a “prescription” a close friend gave her when she was in her lowest life-hating, ‘woe is me’ slump. The concept is simple: give something away each day for 29 days. The gifts don’t have to be grand or even material. They can be as simple as offering a smile or kind word to a stranger, but they have to be sincere. I embarked on my own 29-day gifting challenge back in March and, as in Walker’s case, the effects were profound. The challenge allowed me to step out of myself and realize just how much I have to be grateful for; it shifted my perspective completely. For the last three weeks, I have been heavily focusing on how much I have, how much I waste, etc. It’s time to start thinking about how much I can give. So today begins my 29-day giving challenge. 29 days will put me well into November but that’s a-ok with me!